A blog dedicated to anything and everything Hallyu! So prepare yourselves for a bombardment of posts on almost anything with-in the realm of Korean Entertainment. I can't express enough how much I ADORE this rendition of "Best wishes to you"
Choi Jin Hyuk may not have the best vocal range, but the man can definitely sing. 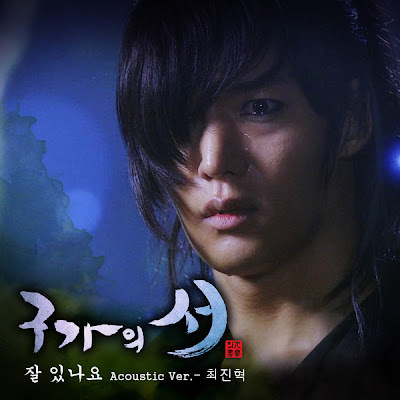 as you listen to Choi Jin Hyuk sing, it becomes obvious that it's very easy to lose yourself in the song. While his voice may be low in timbre, its at that range where you can't help but fall in love with it. Yet, even though he may not be able to easily reach the higher notes, when he needs to he nails it. All while maintaining a very pleasant sound and staying in tune. I will support anything Choi Jin Hyuk ends up doing all while I sing praises of this man's voice to those who will listen (and force those poor souls who don't believe me, to at least give him a good listen). quickly changing to a love for a select few artists. the thing is at least 2-3 pages with all the pictures and video when I put it in word. We left off last week with Le Si, a lose shoe lace and the real Tian Xing kneeling before her in all his arrogant-knight-in-shining-armor glory, offering to help her. The preview showed a sick Xiao Lu and a very intense forehead touch . . . . I wonder how Tian Xing is going to handle his growing affection for Le Si . . . In an effort towards being more productive on this blog, I have decided to finish as many of my incomplete posts as possible. I have so many posts in draft mode people it isn't even funny anymore. Then again I digress.....I present to you, what will be the first of (hopefully) many more posts for your reading pleasure. To start, go to your GIF folder. You have one I know you do. For each part choose every 5th GIF. Begin with either the 5th GIF from the bottom and then move up your list. OR start with the 5th from the top of your list, then move down. If you reach the "end or beginning" of your folder and you still have sections which you need to select GIFs for, continue with your count from the opposite side of your current location. Everyone Ready? And we foolishly thought the heartache was over at the end of last week's Fall In Love With Me. We also foolishly hoped Tian Xing would accidentally confess to the truth. We were wrong. . .so very, very wrong. In this episode, Tian Xing continues to either dig his own grave or eat crow--neither of which was all that appealing for him, I'm sure because it sure wasn't for us. Let's get to recapping, shall we?